Hosted by Indy Neidell, YouTube channel The Great War shows you the history of the First World War in the four years from 1914 to 1918, exactly 100 years ago. 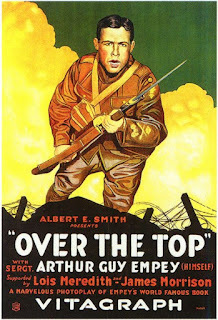 In September 2016 a special episode was broadcasted on film propaganda during World War I.
Cinemas were already pretty popular when World War I broke out in 1914. After initial hesitation all warring nations started to embrace the new mass medium for their propaganda. The episode shows that, since it was technically difficult to deliver the authentic material the audiences wanted, war films were frequently staged. Film scripts opened the opportunity to transport any message about the war to a mass audience. You can subscribe to this interesting show and watch a new video every Monday, Thursday and Saturday. In June 1915, Dutch journalist Marcus van Blankenstein left Berlin and visited the Eastern Front. A correspondent for the Nieuwe Rotterdamse Courant, Van Blankenstein witnessed the destruction in Eastern Prussia as a result of the invasion of the Russian army. The report that he filed on this trench trip is also interesting for film history because in this story he mentions an American cinematographer and the way he worked while filming the war. Although he doesn't mention any name, by checking the details on Van Blankenstein's trip it is clear that the cinematographer was Wilbur H. Durborough, the flamboyant American reporter who accompanied the German army together with his camera operator Irving Guy Ries. Durborough has been mentioned before several times in this weblog, as well as in our book American Cinematographers in the Great War. At the moment described by Van Blankenstein Ries evidently was at another place and Durborough himself cranked the movie camera. 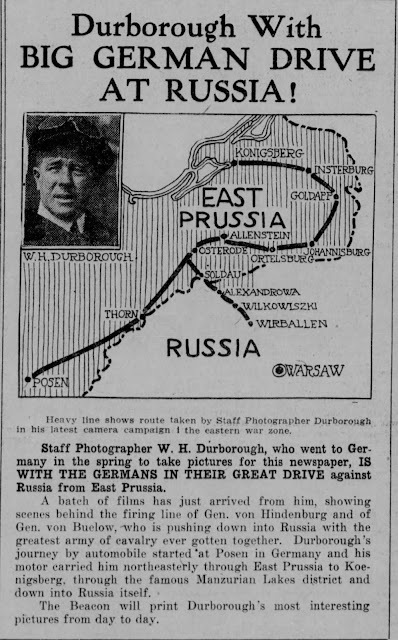 According to this Dutch reporter, Durborough staged some of his film scenes, such as a group of Russian prisoners of war who were asked by him to perform a colorful folkore dance. "With all pleasure I would make a band of brothers out of them and join them into battle! ", Durborough exclaimed after he had seen their performance. Van Blankenstein clearly didn't approve of his journalistic methods. "It is so typical for these American business men. To these people this whole war apparently is nothing more than a chance to make a big movie drama out of it. A spectacle that they can watch and enjoy from a professional point of view." Van Blankenstein's original press report can be read here. To mark the centennial of the First World War an international conference was organized recently on the birth of military cinematography. 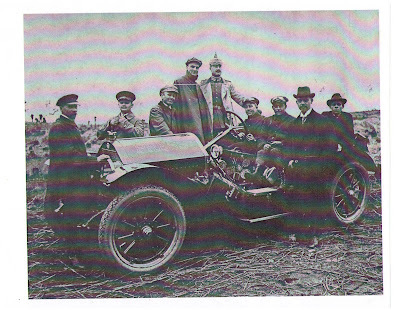 Authors Cooper Graham and Ron van Dopperen for this occasion were asked to prepare a presentation on the film program by the U.S. Signal Corps during World War I. 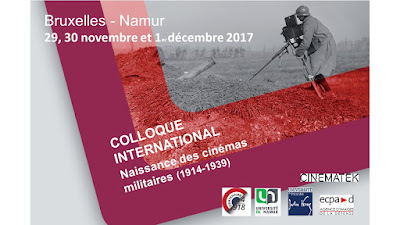 The conference The Birth of Military Cinemas was organized in Namur, Belgium, on November 30 and December 1 by the Royal Belgian Film Archives, in cooperation with ECPAD, the Mission Centenaire 14-18 France and the Universities of Namur and Picardie. With contributions by leading film historians representing most of the European countries that were belligerents during the Great War our presentation focused on the official military cinematographers that accompanied the American Expeditionary Force in France, how these men were trained, improvements in camera technique, the conditions at the front while filming the Great War and the uneasy relationship between the U.S. Signal Corps that was officialy assigned to cover the war and the Committee on Public Information (CPI), America's wartime propaganda agency. As demonstrated in our presentation, the work done by these military cameramen from the United States improved significantly as a result of the CPI film efforts. 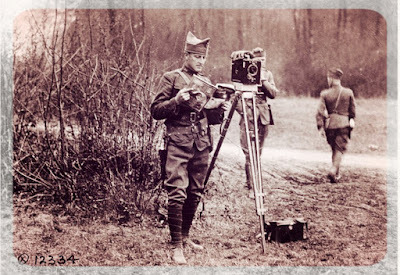 At the time of the Armistice in November 1918, the Photographic Unit of the U.S. Signal Corps had become a remarkable powerhouse, with seven photographic field units on duty in the combat zone on the Western Front. At the National Archives in Washington, D.C., there is also a huge amount of footage available that was shot by these cameramen. 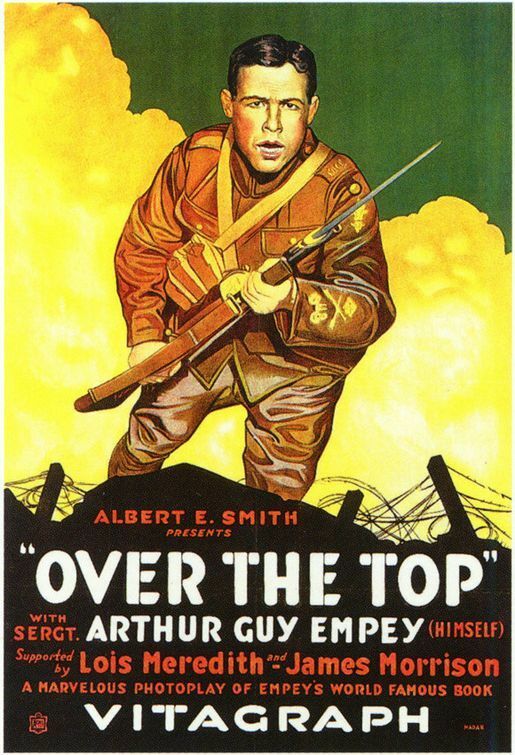 The American film legacy of the Great War is impressive. Based on our book American Cinematographers in the Great War, we did additional research for this presentation on the Signal Corps films of World War I. We edited the results into a film presentation and showed this short documentary for the first time during the conference on December 1. Enjoy this web launch! Here is a link to the conference paper that we submitted on the birth of military cinematography in the United States during World War I.